Continued from 7/8/18 Read Part One here. In 1879, a fire raged through Deadwood, burning many places to the ground including Mollie’s. The day before the fire, one of Mollie’s girls had died due to either injury from a cat bite, or some other illness. She lay in her coffin in Mollie’s parlor as the roof caught fire. Mollie made no action to save her furnishings or herself until someone could take the young woman’s body to the neighboring town of City Creek, for burial. Though Mollie had a reputation for a lack of generosity toward other “soiled doves” of Deadwood, the newspapers, particularly the Black Hills Daily Times, loved to stir up controversy concerning the popular madam. In one instance, the Times alluded to Mollie providing information to the U.S. Marshall regarding three of her competitors selling alcohol without a license. Mollie retorted back in a note to the Times stating she would do nothing of the kind against her “sisters in sin.” The Times later stated they received their information from another source. Though newspapers like the Black Hills Daily Times loved to report stories of Mollie’s wickedness, they also gave her credit for her generosity with local girls like Miss Pettijohn and Miss Woodall, and also for her financial support of Irish Famine Relief. According to Bryant, with the passing of time, the stories of Mollie Johnson became less and less frequent. He alludes to the idea she traveled more, or that perhaps the newspapers just lost interest. Maybe with age, Mollie settled down and didn’t give them much to write about. We may never know what prodded Mollie to become a prostitute like so many other women who settled in the west. Perhaps she had no family and struggled to survive, or perhaps she saw an opportunity to become a businesswoman in a time that didn’t allow women to prosper by any other means. Whether or not the stories are true, the accounts of Mollie’s life and her business paint a colorful portrait of a woman who made an impact on the town of Deadwood, South Dakota, and the history of the wild west of the late 1800’s. Are you a historical fiction fan? Do you love a good adventure and a strong female lead? 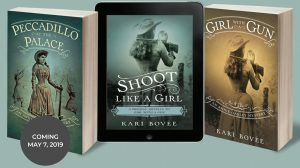 Check out my Annie Oakley Mystery Series here! She was a gregarious and sweet natured person. She often put other’s needs before her own. She nursed the sick and took care of the poor. Mother Teresa? No, a prostitute turned madam named Molly b’Damn. Maggie Hall was born in Dublin, Ireland on December 26, 1853. Her Protestant father and Irish Catholic mother raised their beautiful golden haired child to be obedient and kind-hearted. They provided her with a lovely home and a fine education. The beautiful child grew to be a stunning young woman. Tall, with a halo of golden hair, sparkling blue eyes and an elegant, shapely figure, many men sought Maggie’s hand in marriage. She always managed to discourage these proposals because she desired more from life than an 1870’s Ireland could offer. At the age of twenty, she set sail for America. Little did Maggie know, her life was about to change. She finally met a man she couldn’t reject. He was handsome, charming, well-to-do, and loved by many women. His name was Burdan. By his third visit to the bar, he proposed marriage. Maggie accepted and left her job. She wanted to be married in her beloved Catholic church, but Burdan insisted on a Justice of the Peace. Once they were married, Maggie’s husband suggested her given name was too common and she should change it. He liked “Molly” and oh, by the way, the union was to be kept secret. If his upper-crust family found out he’d married a barmaid, his endless funds would disappear. The secret couldn’t be kept forever and that is exactly what happened. The newly married Burdans were penniless. Burdan had never worked a day in his life and didn’t know where to begin to find employment. Molly wanted to go back to her job at the bar, but Burdan wouldn’t have it. They were evicted from apartment after apartment. Life was dire and the Burdans were desperate. Molly’s husband noticed the way his friends and other men looked at his beautiful wife. Perhaps she could earn them a living. 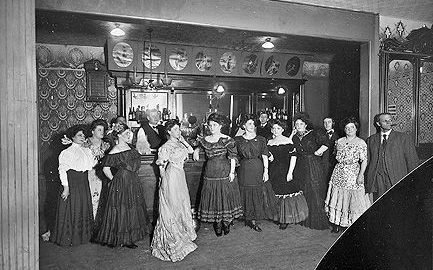 Burdan suggested that Molly start “entertaining” his friends for money. Shocked, she refused. It was bad enough she hadn’t been married in the church, but this horrid sin? Unfortunately, her love for her husband won out, and she finally agreed. During this time of “employment” Molly made visits to confession. After she confessed her sins the second time, she was excommunicated from the church. Thoroughly heart-broken and damned to hell forever, Molly left her husband of four years and left New York for the promise of the West. 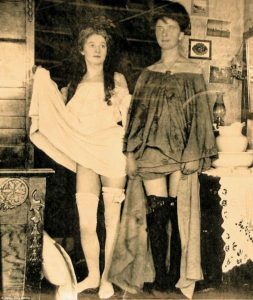 She travelled to California, Oregon, Nevada and the Dakota Territory, working as a much sought after prostitute. She garnered an expensive wardrobe and lived a lavish life-style. But at thirty, Molly grew restless again. She’d heard of a prosperous gold strike in the Coeur d’ Alenes in Idaho. In 1884, she boarded a train for Montana, bought a horse, and then joined a pack-train for Murray, Idaho. The horse-back ride was long and hard, and those on foot particularly suffered. The pack-train started through the Thompson Pass, and was instantly beset by a nasty blizzard. Molly noticed a mother and young boy, not clothed for a harsh storm, struggling more than the rest. They soon fell behind. When the travelers came upon a meager shelter, Molly tethered her horse, gathered up the woman and her son, led them to the shelter, and bundled them up in her furs. She told the pack train to move on without them. The three, wrapped in Molly’s furs, huddled for warmth. The townspeople of Murray heard about Molly and her rescue attempt from the travelers and feared the three would not live through the night. Imagine their surprise and delight when a horse carrying two women and a child came galloping into town. People rushed to meet them and tend to their needs. Molly ordered a cabin for the young boy and his mother, to be charged on her bill. When they offered her lodgings in the hotel, she refused. She wanted occupation of Cabin Number One. The cabin reserved for the Madam of the town. A young Irishman, Phil O’Rourke, helped her down from her horse and asked her name. When she said Molly Burdan, he laughed out loud and said, “Well now, fur the life o’ me. I’d never o’ thought of it. Molly b’Damn!” The name stuck. Molly built a successful business in Murray and was beloved by the townspeople. Her restless spirit had finally been calmed. She was good to her “girls” and provided a comfortable home for them. She fed anyone who was hungry and offered shelter to the homeless. She would often hike up the mountain in her fine clothes to tend to a sick prospector. And, she even attended Protestant church services. One of Molly’s creative means of making money in the prosperous mining town was to have her “big cleanup bath,” when the cleanup of the mines was due. She would set up a tub in the back of her establishment, fill it with water, and encourage the miners to dig into their pockets and cover the bottom of the tub with gold. When it was sufficiently covered, she’d strip down and sink into the water. For the right price, she’d even allow one of them to scrub her back. Witty, risqué and sometimes ribald, Molly was also a person who cared deeply for others. In 1886 a stranger walked into Murray with a raging fever and immediately died. He was carrying small pox and had exposed the entire town. It’s wasn’t long before people became ill and many died. The healthy townspeople retreated to their houses, afraid of the disease. This wouldn’t do for Molly. She called a town meeting and rallied the healthy to help the sick. She and her girls worked tirelessly to tend the ill miners and their families. She rarely took the time to eat or change her clothes during the weeks that small pox raged through Murray. Eventually, the disease dissipated, but Molly was forever changed. In the coming months she weakened, lost weight and was besieged with a perpetual cough. Soon she was bedridden and the good women of Murray came together and took turns watching at her bedside and taking care of their generous friend, round the clock. She was finally diagnosed with consumption and died on January 7, 1888. On that day, the townspeople of Murray retreated to their homes. Curtains were drawn and the saloons were closed. Work ceased. The Protestant ministers made arrangements for her funeral and thousands from the area attended to say farewell to the good-hearted prostitute who had brought life and love to their town. To this day, the people of Murray and the surrounding area, celebrate their long lost friend with the Annual Molly b’Damn Gold Rush Days event. Her spirit will live in their hearts forever.